Monsoon is the only season during which I take extra care of my feet because it is the only time when my feet make contact with mucky, marshy surfaces. I am a hygiene freak and I cannot stand slightest of sludge on my skin. During monsoons, I not only wash my shoes every day but also scrub my feet each time I return home. I was looking online for anything that is specially meant for foot care and I saw SSCPL’s hand and foot care products. 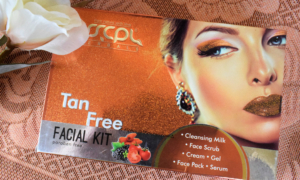 I am a big fan of SSCPL products because (a) they contain natural ingredients (b) they are free of paraben and other harmful chemicals (c) they smell HEAVENLY and lastly (d) they are pocket-friendly. So, I just had to buy their hand and foot mask and relaxing gel. I have used their clay mask a few times and here is my experience with it. The clay mask contains essential oils of clove and cinnamon that are known to purify and lighten patchy skin and leave it soft, smooth and supple. Swipe a dollop of the clay mask from the jar and rub it over your hands and feet. Leave it on for around 20 minutes or till the mask dries and then wash it off with lukewarm water. Does it fulfil its claim? The mask comes in a transparent plastic tub with a green lid. I scooped a generous amount of the clay mask and applied it to my feet. I applied it onto my heels, toes and nails. It had no effects on my nails but it worked great for my skin. The skin around my toes is rough and this mask effectively softened it. It brightened my skin instantly and made it soft and smooth. Even my heels feel soft and supple. Seeing it work so well on my feet I used the mask on my hands and I have to say that the mask smells GREAT. The combination of clove and cinnamon oil smells almost aromatic. The smell lasted long after washing it off and I kept smelling my hand all day long. I think SSCPL should launch a line of body mist or perfumes because their products smell so DAMN GOOD! I am obsessed with the smell of Saffron cleansing milk. The effect of this mask lasts for days. My feet and hand feel soft even after 2 days. I thought I would have to clean and scrub my feet before applying the mask for it to show some effect. But I was feeling lazy so I did not bother to scrub and applied the mask directly onto clean skin. And it worked. So next time I feel lazy to do my regular foot care regime, I will just apply this mask as it does the job in lesser time. Nothing. I love this mask and did not find any flaw in it. I give SSCPL Clove Cinnamon Hand & Foot Mask a 10 out of 5 rating. This clay mask exceeded my expectations so I am rating it higher than the limit. I would strongly recommend this hand and foot mask to anyone who is looking for a hand and foot care product. This mask is a ‘MUST TRY’ product.